World's Finest Batons with Inlays TAKT Batons are available in 3 different shafts materials - Carbon fiber, Fiberglass, and Wood. Beautiful inlays, exotic, rare and expensive materials make for exclusive batons. BATON CASES Baton hard cases and tri-fold cases made out of leather and synthetic fabric to complement your hand balanced batons. ELEGANT BATONS WITH INLAYS Beautiful handcrafted inlays of Mother of Pearl and Boxwood Parisian Eyes, Brass Cross, Bone Cross, and Abalone Dots. Assortment of exotic wooden handles Each TAKT Baton is precisely hand balanced so that there is a feeling of apparent weightlessness, which leads to a fast response. 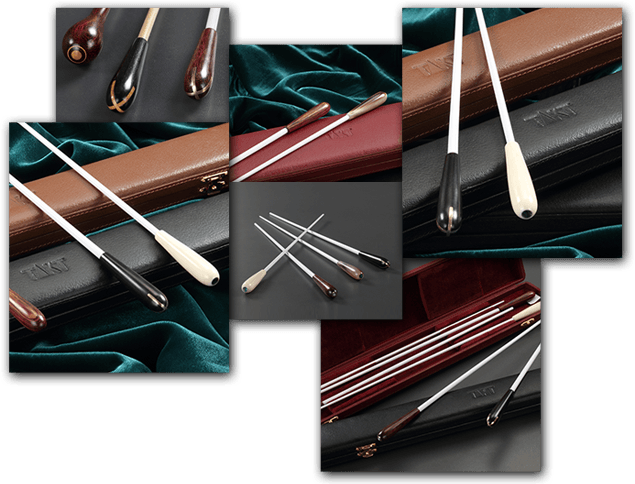 TAKT Symphony conducting Batons, through their symmetry, use of exotic woods / materials, beautiful inlays, balance, and light weight strives to provide the best in class batons and accessories to the modern day conductor. Every Takt Baton is precisely hand balanced at or near the joint of the shaft and handle to give the feeling of apparent weightlessness. The light weight (7 to 17 grams) of the batons combined with careful balancing ensures a fast response. Inlays of Mother of Pearl, Abalone, Brass, Ebony and Boxwood delight the eye and add elegance. Exotic, rare and expensive materials (Ebony, Rosewood, Bone,Horn and Snakewood) make for exclusive batons. We aim for each TAKT baton to be the best in its price class. I love many of the batons, especially the ones with brass cross inserts (15”). Copyright © 2016 TAKT BATONS All rights reserved.